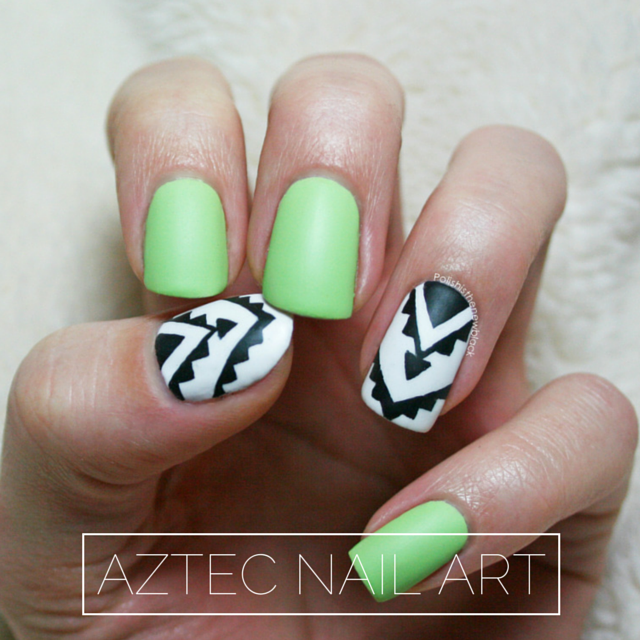 I wore this design both matte and glossy and I actually really liked both! I couldn't really decide which was my favourite! Pictured above is the matte version. So.... onto the polish! I used Essie 'Blanc' and Kandy Colors 'Soft Mint'. The detail was done using black acrylic paint and my Pure Color Glamour 1 brush from Stylish Nail Art Shop on Etsy. I absolutely LOVE this brush and use it for most of my detail. I have purchased several brushes from Jascha and they have been absolutely perfect! I cant rave about her brushes enough! They're allI use for my nail art. I have a post to come with some swatches of Kandy Colors polishes so keep your eyes peeled for that! They have been kind enough to allow me to swatch for them! I've been really impressed with the polishes so far. They're a UK based company that make 5-free polishes and also have the option for customers to make their own custom polishes! I will write a little more about them in my next post but feel free to check out their website too - linked above. I also created a tutorial for this look. Now granted this was my first ever tutorial so it isn't a blockbuster hit or anything... but you get the idea! It was actually a lot harder filming and editing a video than it looks! It took a long time to edit the speed and crop the clip, but I'm hoping I will improve on this with time! So what do you guys think; matte or glossy?